Your next thought might be, whether it is not some kind of an „original joke“ or perhaps „marketing trap“ with its aim to make a profit of nowadays wellnes trend or whether this is not just a monkey business. 23. of April 1516 Bavarian duke Vilém IV. issued a law, which was ordering, that in Bavaria, in order to make a beer, is allowed to use only barley, water and hop. This is valid and applies up to this day. Barley is supposed as a barley melt, because with barley as it is you wouldn´t be able to make it. Duke had forgotten about one ingredient though, without it you wouldn´t produce a beer. He had forgotten about yeast. Yeast decay sugary wort to alcohol and as a fallout, during this fermentation proces, carbonic oxide and aromatic substances comes up and the heat is released. At that time, people didn´t know, the yeast makes fermentation and they also didn´t know, the yeast contains valuable substances (vitamins, amino acids, minerals and trace elements) and that it gives a beer a specific flavour. 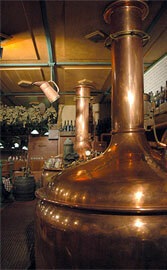 By the way, at that time a beer was consumed unfiltered as a cellar beer. An ordinary person drunk it from stone jugs, gentlefolks from glass cups and peers from silver or gold goblets. If we say the term beer, we understand a beverage brewed from the ingredients, which were mentioned above, of bright or dark color, sparkling, with a white foam, containing alcohol (at average 5 %) and carbonic acid (at average 4 – 5 g/l ), of sweetish or bitter flavor. Today beer is usually filtered in order to be clear. Recently, an unfiltered beer is coming back to shopping racks and its getting more fashionable now. It means a beer is bottled straight away from stock tub. That kind of beer is labeled as a natural beer, cellar beer or yeasty beer. Optimal consumption temperature of a beer is 8 – 10°C. At this temperature are the ideal conditions for the aromatics and hop flavors to be released, also a beautiful foam is generated and a beer has a relish. An overcooled beer is not frothing, usually is cloudy, taste is not good and "lies within a bottle as a death man“, as brewers say so. Unfortunately, we can find this negative in gastronomy quite often. An over warmed beer has a flat flavor, no relish, not frothing and often´s foxily (e.g. beer tapped in advance for coach trips). A term beer bath is associated by professionals with an optimal consumption temperature of a beer. Moreover, that means the end of all dreams. Can you imagine the "pleasure" lying without any movement in a bath which has a temperature 8 – 10°C? If a beer is warmed up during a bath, it would cause releasing carbon dioxide. Carbon dioxide is a gas which is 1,6 times heavier than the air, which paralyze airways until it brings a suffocating stroke. No brewer, even in his dream, would have an idea to soak himself in an open ferment tub. He would get a goose bumps and also there is no way to do it because of carbon dioxide. If we split up the word beer bath to a beer and a bath, we will get entirely new bunches of possibilities. A separate term a bath has lots of variations; partly it is a matter of type (foot-bath, hip-bath, spray shower bath, overall bath etc.) partly it is a matter of effects on a human body (thermal bath, quaggy bath, herbal bath, etc.). So if we choose, lets say, hip-bath and thermal bath in addition with a beer or more precisely. Ingredients the beer is made from, we will find out, that the term „beer bath“ is actually logical and obvious, and it is logical also for a brewer.